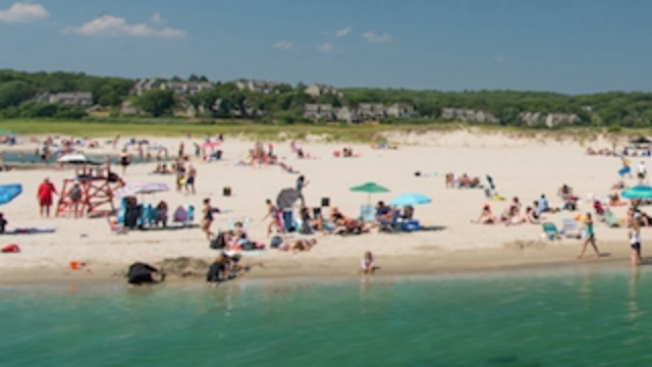 Beach gem on the North Shore – drive or hop on the T to Gloucester! True fact, we live on the water and the Boston beaches are cleaner than ever. However, it’s always fun to switch it up a bit, don’t ya think? Hands down, one of the most beautiful beaches on the North Shore of Massachusetts is Wingaersheek Beach in Gloucester. (Wing•ger•sheik). The odd name has historical roots that date back to the early Dutch settlers who called it “Wyngaerts Hoeck,” which was derived from “Wyngaerton” (meaning “Vineland”). The beach sits along the Annisquam River towards Ipswich Bay and at low tides produces numerous tidal pools that are great for the little ones to romp around in. Low tide also brings a long sandbar that’s perfect for getting away from the beach, which tends to get crowded especially on weekends. The beach has smooth white sands, crystal clear waters, and huge rocks in the water that you can climb around at low tide. The beach stretches a good distance at goes at low tide and the water stays shallow. The tide pool formations are perfect for finding snails, tiny fish, shrimp, hermit crabs and other sea creatures. It’s best to visit on a weekday as the weekends are very crowded and the parking lot can fill up quickly. However, added bonus – you don’t need a car to get to Wingaersheek – the Commuter Train out of North Station will take you to West Gloucester Station and it’s a quick taxi or Uber ride (just four miles) from the station. Lifeguards are on duty from 9 a.m. to 5 p.m. from Memorial Day weekend through Labor Day weekend. No water floats or surfboards are allowed, but the long sandy beaches are great for sand castle building. There’s a food stand, restrooms and showers, but alcohol is strictly prohibited. Parking during the week is $20 and $25 on weekends, but non-resident parking is limited (we’re familiar with that caveat, Amiright??) so again, the early bird gets the parking spot and the pick of the shoreline. The beach is also handicapped accessible. If driving, take Route 128 North to Exit 13. At the bottom of the ramp, take a left onto Concord Street and follow for about 1 ½ miles. You will see a traffic island with a sign saying Wingaersheek Beach. Turn right onto Atlantic Street and follow to the end. As you turn onto Atlantic Street look for the sign regarding the beach parking lot. If the “lot full” sign is out it means the lot is closed to non-residents and only those with a resident beach sticker can gain access to the lot. The post Road Trip: Wingaersheek Beach appeared first on Caught In Dot.